Extremely controversial amongst parents and film critics when it was originally released, Silent Night, Deadly Night didn’t start the pattern for the 1980s when horror films were critically shunned and derided, but it certainly took more of a beating than most, going so far as having it pulled from theaters. Today, of course, it’s seen as one of the classics of the slasher genre. Telling the story of a young boy named Billy who is psychologically scarred after seeing his parents murdered by Santa Claus and put into an orphanage, he grows up to be a withdrawn and quiet man, until his job requires him to wear a Santa Claus suit, which triggers him to go on a homicidal rampage. 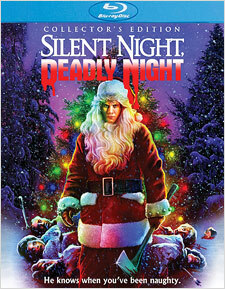 Although the film was released with a proper marketing campaign by the then newly-formed TriStar Pictures, the reaction to Silent Night, Deadly Night was obviously severely overblown. Advertised on TV during the afternoon, it’s no wonder that the film stirred up so much controversy. On the other hand, seeing the film today, you realize just how tame it is compared to what’s shown on TV nowadays. The fact that it was so detested made horror fans just want to see it that much more, with many of them not getting a chance to until it landed on home video. Everything from an ax, the claw end of a hammer, a set of Christmas lights, a bow and arrow, and even a set of mounted deer antlers get put to sadistic use during the aforementioned killing spree, which was ultimately trimmed down for the theatrical version. Silent Night, Deadly Night is an all-around amusing film, and whether it was completely intentional or not, has a touch of satire to it, sometimes accidentally pulling off unintentional comedy. It’s no “Garbage day!” (to quote its sequel), but it’s hilarious hearing Billy scream “PUNISH!” before he takes his victims out one by one. While the first half of the film, which is the initial backstory, is a bit ugly and not that pleasant to watch, the latter half is cheap, enjoyable fun. For Scream Factory’s hotly-anticipated Collector’s Edition Blu-ray, both the theatrical and extended unrated versions of the film have been included. Both have been sourced from a new 4K scan of the original camera negative (done by Sony themselves) with standard definition inserts for the extra footage. Unfortunately, according to the text that opens the unrated version, the original negative was cut but TriStar and none of those trims could be found in Sony’s vaults. The previous Blu-ray release by Anchor Bay was highly criticized for its poor quality, which was an assembly from several different sources. But thanks to Scream Factory, we now have a superior, and dare I say, definitive presentation of the film – at least for the time being. It’s an extremely filmic presentation with grain levels that aren’t thoroughly solid all the time due to the age of the material, but reproduced well with a strong encode. Fine detail is through the roof in both close-ups and background elements with amazing depth. Color reproduction is also potent, with greens and reds in particular really popping, as should be expected from a movie that takes place on Christmas. Skin tones are also quite natural while blacks are solid with strong shadow detail. Overall brightness and contrast are excellent and there appears to be no evidence of digital tampering on display. Minor damage such as scratches and speckling are leftover, but it’s a sharp and precise presentation, quite possibly one of Scream Factory’s finest. The sole audio track included with both versions is English 2.0 DTS-HD with optional subtitles in English SDH. Although an understandably narrower presentation, it still packs a punch in different areas. Dialogue reproduction is clean and clear while sound effects have some occasional boost to them, including screams and gunshots. The score is mixed in well with everything else and is really the strongest aspect of the soundtrack as a whole. There are no major hiss or age-related issues leftover and there isn’t much in the way of dynamics, but it’s a solid audio presentation nonetheless. The supplemental material is spread out over the two discs in this set. On Disc One, which contains the theatrical version of the film, there’s the original R-rated theatrical trailer, the VHS trailer, 3 TV spots, and a radio spot. On Disc Two, which contains the unrated version, the bulk of the main extras can be found. They include new material from Justin Beahm’s Reverend Entertainment, beginning with an audio commentary with actor Robert Brian Wilson and co-executive producer Scott J. Schneid; another audio commentary by writer Michael Hickey, composer Perry Botkin, co-executive producer Scott J. Schneid, and editor/second unit director Michael Spence; the excellent Slay Bells Ring: The Story of Silent Night, Deadly Night documentary, which features interviews with writer Michael Hickey, co-executive producers Scott J. Schneid and Dennis Whitehead, editor/second unit director Michael Spence, composer Perry Botkin, and actor Robert Brian Wilson; Oh Deer!, an interview with actress Linnea Quigley; the Christmas in July: Silent Night, Deadly Night Filming Locations featurette; an audio interview with director Charles E. Sellier, Jr. from Deadpit Radio in its extended version form; Santa’s Stocking of Outrage, which is a collection of quotes from various folks who were not in favor of the film when it was released; and a brief animated poster and still gallery. Needless to say, this is another release that’s been knocked right out of the park. Despite not being able to find the original trims for the unrated version of Silent Night, Deadly Night, they’ve more than made up for it with an excellent transfer and extras package. A thoroughly satisfying release, this is definitely a disc that horror fans will be popping in for the holidays from here on in. Highly recommended.